The present Dean is a graduate from one of the prestigious Medical College in India (i.e. Bangalore Medical College). 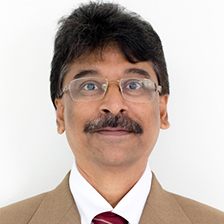 He is board Certified to practice in India and has some Academic Publications. He joined Spartan as a Lecturer some twenty (20) years ago. However; before joining Spartan he taught at a Medical College in India and has completed a year in Dermatology training at Bangalore Medical College. The Dean (i.e. Dr. Gurumurthy) is a dedicated and enthusiastic teacher with great loyalty to the school and its student’s .He has a vast knowledge in his particular subject of teaching and this has been reflected on the improvement of student’s performance. In fact ;he has been teaching Neuroanatomy for the past eighteen(18) years and has made it simple for the students to understand such a complex subject-as such, he has won various appreciation awards from the various student bodies. Dr.Gurumurthy accepted responsibilities for the Administration in 1994 and has performed credibly. His responsibilities include day to day activities of the school in addition to various academic duties such as curriculum development, Faculty and Faculty /Student Committees and the Research Unit. It must be mentioned that Dr.Gurumurthy was very instrumental in ensuring the Full Accreditation of Spartan by the St.Lucia Monitoring Committee in 2004, NCFMEA approval in 2007 and New York site visit in 2009. He has participated in various Academic and Accreditation workshops throughout his career. The latest was a three (3) day’s workshop for External and Peer Evaluators (i.e. a training programme) in October 2011. This was followed by an examination in which Dr.Gurumurthy passed and is now an official External and Peer Evaluator recognized by the CARICOM Secretariat. In short, Dr.Gurumurthy is an asset for the University and looking forward, the University anticipates great progress under his leadership. Lately: Dr.Gurumurthy played a leading role in the University’s achievement in obtaining provisional accreditation by CAAMP-HP in 2013.